The visually customized phonebook of the Xperia S can store extensive information about all your contacts. Info for each contact is laid out in a tabbed interface that holds contact info, recent calls and more info from social networking services. And if a contact has accounts in multiple services, you can "join" their details to keep everything in one place. Their Facebook photos and interests (part of the Facebook integration) will show as extra tabs. Each contact can have a variety of fields (and repeat fields of the same type), the plus and X buttons let you add and remove fields as needed. The fields cover anything from names (including a field to write the name down phonetically) to addresses, nicknames and notes. The Xperia S held on to signal well and we didn't experience dropped calls. If signal strength is low, make sure you're not touching the antenna at the bottom and you should be okay. Sound is good on both ends of calls, the earpiece is loud enough and there were no interferences whatsoever. The built-in secondary microphone is used for active noise-cancellation so calls are loud and clear even in noisy environments. The Xperia S is the first Xperia phone we've reviewed to have smart dialing. It searches for matches in both the contacts' phones and names. There's voice dialing too (the quickest way to activate it is the dedicated homescreen widget). 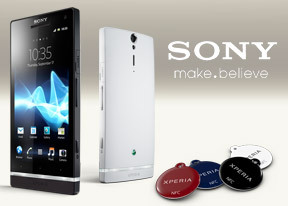 Thanks to the proximity sensor, the Sony Xperia S automatically disables the touchscreen when you hold it up to your ear during a call. There's a Favorite tab too - it includes starred contacts, but you can add other contacts to the list too. The tab displays a grid of contact photos with their first name underneath. We also ran our traditional loudspeaker test on the Sony Xperia S. Scoring an Average result, the Xperia S isn't the loudest ringer around, so you might occasionally miss a call. More info on our loudspeaker test as well as other results can be found here. All texts and MMS are organized into threads. Each thread is laid out as an IM chat session, the latest message at the bottom. You can manage individual messages (forward, copy, delete) and even lock them (against deletion). Add multimedia (photos, videos, sounds, etc.) will convert the message to an MMS. As for text input, the Xperia S offers a customized on-screen full QWERTY keyboard. Typing is pretty comfortable even on the portrait keyboard, keys large enough and well spaced. Flipping the phone to landscape gives you bigger, easier to press buttons. The Xperia S is probably as good as you will ever need - in virtual keyboard terms of course. In terms of customizations, the Xperia S keyboard features the so-called Gesture input. It works the same way as the Swype - instead of tapping on keys you sweep a finger across the keyboard. Even if you've never used Swype input before, you'll quickly get used to it.